According to Samsung Mobile India’s Facebook page, the Samsung Galaxy Tab 750 also known as the Galaxy Tab 10.1 is all set to launch in India on the 10th of August. The tablet has already been launched in various countries and India will finally get its hands on the slim 10 inch screened tablet very soon. The features of the Galaxy tab 750 include a 10.1-inch HD capacitive touch screen display with 1280 x 800 resolution, a 1.0 GHz Nvidia Tegra 2 Dual Core Processor, a 3MP Camera with autofocus & LED flash and a 2MP front camera, 16GB/32GB internal memory options, 1GB RAM, Wi-Fi, Bluetooth v3.0, A-GPS with Compass, 3.5mm audio jack, surround sound speakers, 7000 mAh battery. 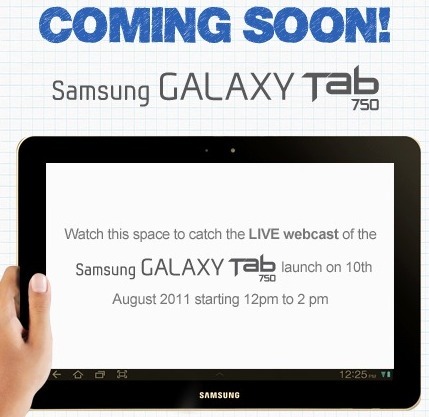 You can watch the live web cast of the Samung Galaxy Tab 750 launch event on https://www.mobigyaan.com on 10th August 2011.